Tired face in the morning. Had to reach Golden Mile at 6.15am for this coach! After about 7hours, we are finally reaching! Reason why some photos look so dark is cause some of the lamps weren't on. I had a hard time looking for the switch! LOL! Was desperately searching for the normal white main switches. End up, their lamps have individual switches hahahahas. Love the room as it was clean and spacious, with a big bed and two sofas. When we were there, it was 21 degrees. It felt like a 25 degrees? In the noon it actually wasn't cold. Sis and I each had a cup of ice chocolate. It was super thick! The food that we had! I mean what can go wrong with vege right? Also, there was fresh salmon in it! Fish and Chips was rather unique. It's not the normal plain fried fish. It had a layer of herbs under the fried skin. New York Spaghetti with Meatballs was not bad. Peri Peri Chicken Wings was okay. It had a special sauce but the chicken was a tad too salty. Didn't tried all. Most of the main dishes was for individuals. We will always spam photos of other people's food as well! Hahahahas. We had a wine tasting session! I like the passion fruit one! It was not bad hehex. I think my face turned a lil red after trying them! We tried at least 6 different kinds. 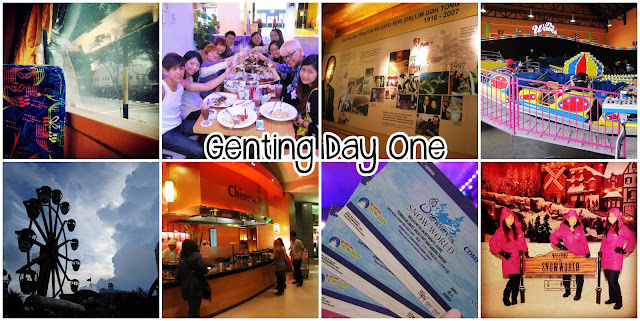 We were given a short guide on the history of Genting Highlands. All thanks to Dr Lim Goh Tong, we have our nice cold getaway! If he didn't build up Genting many many years back, there wouldn't even be this trip! Totally don't have to worry about having an over-crowding situation. The first time I came here was in 2005 I think. It has been 8 years and I am finally back in Genting! That "flying" ride (no idea it's name) was the first ride I took here in 2005! Happy girl in the theme park! Our purpose of coming here. To try out their new ride - The Waves. Take it and you will now why. Also, be prep that it goes forward, then backwards! P.S. Even grandma took this ride! And she said it was okay lols! She went around to help us take pics! And we were on our way out of the theme park. It was free and easy time. We could stay on to play. But Grandma's feet aches if she walks for too long. But I heard Sasa there is quite cheap. Movie is cheap there too! The statue of liberty so hip one hahahas! Two long tables were reserved for all the bloggers. They had a wide range of food there for the Dinner buffet. Some of the stalls, even cook on the spot for you! and they will cook it on the spot for you! I love the Chocolate Mousse! Yummy! The Lian Bu (googled it and it is called Syzygium Samarangense) was very sweet too! I think Malaysia and Thailand has the yummiest lian bu? If you go to Genting, please spam the lian bu hahahahas! Grandma liked the food here. Think she prefers chinese food. But since we were still early, we walked around first. That's how SnowWorld looks like. A super pretty pink/purple place! A photo in the souvenir shop! The snowman is so cute! All these outerwear, gloves and boots are all free for use. No need to pay extra to rent them. It's my second time in SnowWorld. 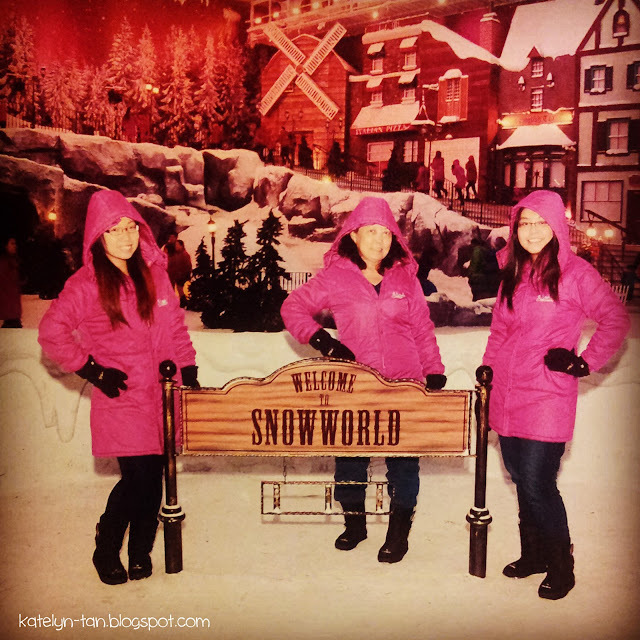 When I was in Genting in 2005, I went to SnowWorld too. But it wasn't as pretty then. Think it was plain white. But now with the pink/purple lightings, it's super pretty! Didn't try it this time though. Cause when I wanted to try, they stopped allowing people to play. Our illegal photo thanks to Susan! She sacrificed her fingers and camera for this! And there was "snow" falling. That's why you see those white specks. Note: No cameras allowed in that place. It's actually for your own sake, cause it's super cold in there and your camera can freeze! It's what I posted on instagram, filtered. At night it was 17 degrees. Felt like maybe a 20degrees? It was super nice and cooling outside! How I wish Singapore has such weather. Reason why I love Genting so much - it's so cooling there! Okay I don't always have supper. But we were craving for some herbal eggs. Malaysia has yummy herbal eggs! We could smell the herbal eggs when we past by 1 Meter Teh. So we decided to buy one each for supper! :) It was only RM$2 each. After that, we washed up and that was all for that day! Thank you for the great post! Haha, your grandma is so hip! 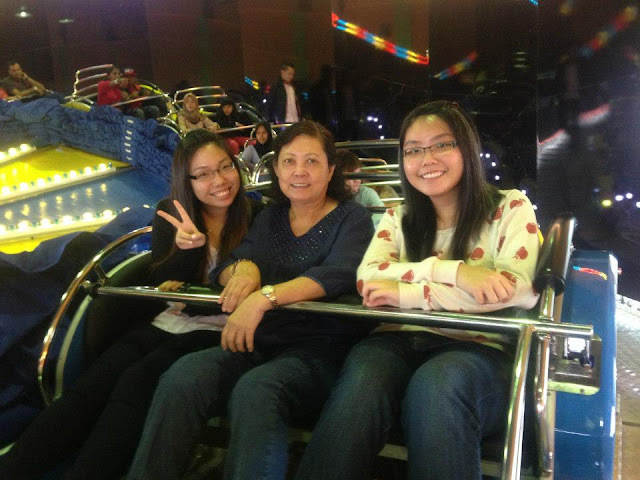 Can play thrill rides some more! Thank you so much for the invite! Hahas yaa! I was like "You really want to try?! Can don't try one leh"